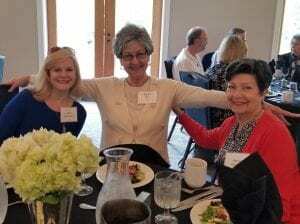 The Spires had quite the impressive turnout at the History of Berry College event this week at the Christopher Browning Pavilion (the newest addition to the Oak Hill and Martha Berry Museum). A special thanks to all who attended the event on Tuesday! Rachel McLucas, curator of the Oak Hill and Martha Berry Museum. 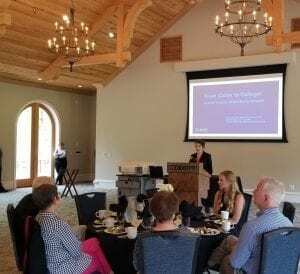 Rachel presented information about the history of the prominent founder of Berry College, Martha Berry, and her honorable mission for Berry College and its students. 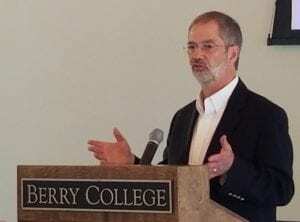 Dr. Steve Briggs, president of Berry College. Dr. Briggs discussed the benefits of building a lakeside senior living community on a college campus. President of Berry College since 2006, Dr. Briggs is a creative and principled leader with more than 30 years of leadership experience. Caroline Knoche, student at Berry College. Caroline shared her experiences as a student currently living on campus and what it means to her to have the opportunity to interact with the future residents of The Spires. Following the guest speaker presentations, attendees enjoyed a complimentary lunch provided with the program. Interested in attending future guest speaker presentations at The Spires? Go to www.retireatberry.com/event to stay up-to-date on all upcoming events or call 706-368-9955.